Unjani award: Johnson & Johnson and the Unjani team receiving their Gold Award at the American Chamber of Commerce’s ‘Stars of Africa’ awards ceremony. A South African partnership that is improving healthcare delivery in vulnerable communities and empowering women has been honoured by the American Chamber of Commerce – and the trucking industry is very much a part of this honour. 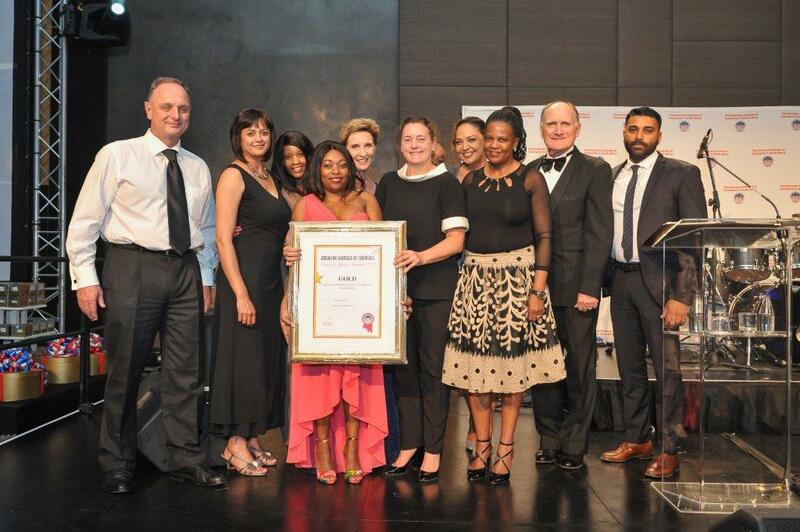 At the organisation’s ‘Stars of Africa’ Awards, Johnson & Johnson South Africa was presented with a Gold Award for its work with the nurse-owned and operated Unjani Clinics, the brainchild of Imperial Logistics healthcare strategy executive, Dr Iain Barton. “This award is hugely significant for Imperial Logistics. It is a double honour to see our valued multinational client Johnson & Johnson lauded for its partnership with the Unjani Clinics initiative that we founded, and which has gone from strength to strength,” says Barton. The Unjani Clinics initiative was developed out of the need for urgent transformation in South Africa’s healthcare system. “Our country faces the triple affliction of HIV/AIDS and TB, and 84% of our population is dependent on an overburdened public health system that is based on a costly curative-care model rather than disease prevention,” explains Barton. Unjani Clinics are strengthening health systems in low-income communities throughout South Africa. Each clinic is owned and operated by a nurse in her chosen community after she has successfully completed the application and selection processes. “In addition to providing an affordable and accessible primary healthcare service for communities in need, Unjani Clinics are empowering black women by creating entrepreneurial opportunities for professional nurses. Further employment opportunities are created due to the need for administration support staff at each clinic, as well as cleaners and other service providers,” Barton expands. Since the initiative’s launch in 2010, Unjani Clinics have provided more than 350 000 patients with health services, including primary healthcare, vision screening, wellness services and chronic disease management. There are currently 35 clinics in the network, 12 of which will be funded by Johnson & Johnson by the end of 2018. Through their collaboration, Johnson & Johnson and the Unjani Clinics non-profit company plan to treat up to 280 000 patients annually by 2018. “We also intend to scale up the Unjani Clinic Network to 70 clinics by December 2019,” says Barton. The bi-annual Stars of Africa competition provides American Chamber of Commerce members with an opportunity to enter and showcase their corporate social investment initiatives in the fields of health and wellness, community development and welfare, and education, training and skills development. Click here to watch a video giving more information on Unjani Clinics.